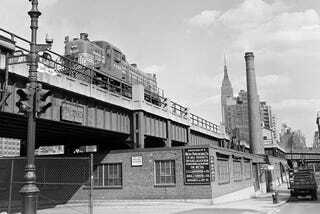 A marvel of industrial efficiency when it was built in the 1930s, New York City's High Line was an elevated train line that chugged up through the lower west side of Manhattan and along the Hudson River. But in the 1980s, the trains stopped running and the tracks returned to nature, sprouting unexpectedly lush gardens of local flora. Now a years-long project to convert a stretch of the tracks into a park is nearing its end, and we've got a timeline of the train's strange life in images, below. Here you can see the three stages of the elevated train tracks. At top, the train as it was in the 1930s, chugging along on its elevated track with the Empire State Building in the distance. In the middle, you can see what happened to the tracks after the train stopped running in the 1980s. It did exactly what the New York disease apocalypse movie I Am Legend predicted for the city: The giant industrial creation slowly grew a layer of grass and flowers. Today, the track is in the process of being reclaimed as a public park. In five years, as you can see in the bottom image, the tracks will be covered over by wooden walkways, flowers will be planted, and people will stroll along a mile and a half of elevated parkway through lower west side Manhattan. The project to turn the tracks into a park was managed by Friends of the High Line. New York's Historic Elevated Train Line [via UK Guardian] Images of the Highline today via Joel Sternfield/Friends of the High Line.